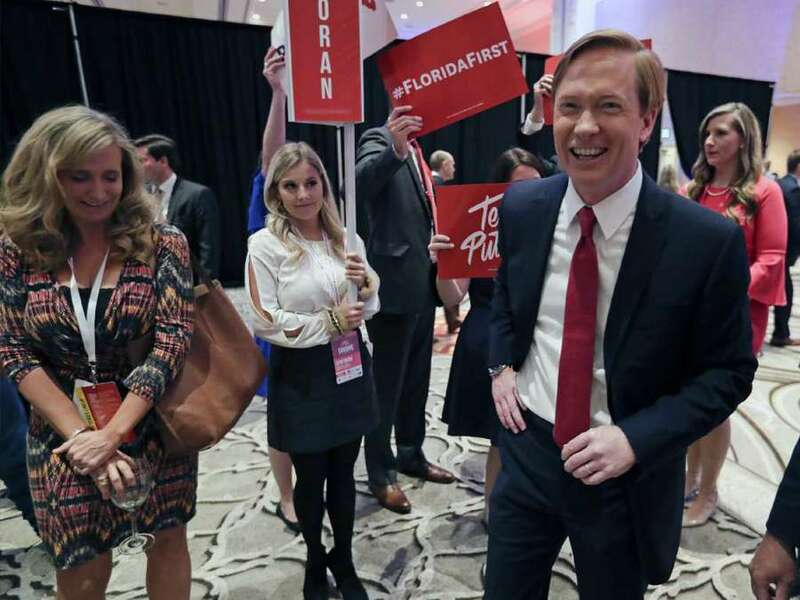 So silver-spooner Governor candidate ADAM HUGHES PUTNAM to blame one (1) female employee for systemic problems in the Florida Department of Agriculture and Consumer Services (DACS). Typical hierarchical, authoritarian deflection. That's what corporate executives and their lawyers do -- how utterly unoriginal. How desperate. Adam Putnam blamed one employee for bungling gun background checks. Records show the issue went deeper. Interviews with investigators obtained by the Tampa Bay Times show an overwhelmed mailroom and confusion in the upper ranks. When state investigators last year found that Florida failed to review results from a national background check for concealed weapons permits, one employee took the fall. Lisa Wilde, a manager in the state's Department of Agriculture and Consumer Services, was terminated after it was discovered she didn't retrieve results of an FBI-database background check, an oversight that led to nearly 300 people getting a license to carry a gun in public who were supposed to be denied. When that closed investigation was made public for the first time last month, Agriculture Commissioner Adam Putnam blamed Wilde, calling the former state employee "negligent and deceptive." Yet according to previously unreported details from the 2017 Office of Inspector General investigation obtained by the Tampa Bay Times, issues with the permitting extended beyond Wilde. Audio recordings and summaries of interviews investigators conducted with eight current and former employees show a critical step in backgrounding applicants was left to "overwhelmed" mailroom employees who expressed little understanding of the National Instant Criminal Background Check System or why it was necessary to review. The permitting process was so poorly understood by the employees involved that the failure to file background checks had escaped the notice of Wilde's supervisor for 13 months. One reason why? She didn't know that Wilde was in charge of it. The investigation's June 5, 2017, report listed the audio interviews as exhibits, which the Timesrequested from the Department of Agriculture on June 8 of this year. The state agency provided the records Friday. The Times obtained the interviews previously from another source: the office of Sen. Linda Stewart, an Orlando Democrat who has demanded an investigation. She said the interviews raise further concerns about the overall permitting process. "I feel like (Wilde) was a scapegoat," Stewart said. "No one else got fired and they had the same responsibility. They fired her like that would take care of it. But it doesn't take care of it at all." Department of Agriculture spokesman Aaron Keller said the investigation itself is evidence that "the agency proactively addresses these issues and holds employees accountable." "No one's safety was put at risk," Keller said, noting that 291 permits were revoked. The Inspector General report determined Wilde was "negligent in her job duties." She was supposed to grab the results of the NICS background checks conducted by the Florida Department of Law Enforcement and attach them to a file of the corresponding applicants for others to review, a process called "indexing." She stopped doing it in February 2016 because she couldn't log into the system and remained locked out until March 2017. Left unmentioned in the investigative report is how other employees said they were swamped by a surge in demand for concealed weapons permits and didn't understand the background check system. The interviews were conducted by Investigator Amanda Cable and Capt. James Hayden over two days in April 2017. In addition to speaking with Wilde twice, they spoke to her boss, Mikah Ford, chief of Licensing Support Services; three of Wilde's subordinates, Renee Stalvey, Emily Jones and Robin James; the two employees who discovered the lapse, Laura Gallagher, Chief of License Issuance, and Brandee Jones, Regulatory Program Administrator; and Wilde's former boss, Mary Kennedy, an ex-employee. In separate interviews, Wilde and others told investigators that the department was overwhelmed by applications. There were 300,000 during that time period. "Bombed" is the way James described it. At the time of Wilde's oversight, employees in charge of processing permits were reviewing 30 cases a day, Brandee Jones said. For 13 months, they didn't notice that not a single application had been flagged ineligible by the NICS system — even though between 40 and 50 are usually flagged a month. As agriculture commissioner, Putnam has made it easier to apply for concealed weapons licenses, something the Republican touts in his campaign for governor. There are 1.8 million people with permits, an all-time high. "It seems like every time there was a shooting it just went crazy," James said. The Pulse nightclub massacre in 2016 happened during this stretch. Stalvey, one of the employees Wilde supervised, was supposed to take over the NICS task, but there wasn't time to train her, multiple people told investigators. As mailroom employees with many other responsibilities in the licensing department, the people responsible for reviewing the NICS summaries said they didn't know what the background checks were for. During an interview in which investigators commended her for being "incredibly forthcoming and honest," Wilde couldn't say what the acronym "NICS" stood for and said no one had explained to her what it was — even though she had been responsible for the task since 2013. "I wasn't aware that it was like a rap sheet or something," Wilde told investigators. "I just didn't know what it was and I'm still not clear exactly what I'm pulling in. Is it an arrest record? I don't know." Even Wilde's supervisor, Ford, a bureau chief, couldn't easily describe the NICS database to investigators or its purpose during her half-hour interview. The Inspector General's summary of the investigation states that Ford told investigators "that Wilde was primarily responsible for the NICS" — but that apparently was news to Ford days before speaking with investigators. Ford "had no knowledge that any report or anything was supposed to have been pulled," said Brandee Jones, who helped discover the lapse. "She had no knowledge of any kind of NICS that she was supposed to be performing." Gallagher also said Ford was "unaware of who was responsible for indexing the NICS database." Those interviewed also described the NICS background check differently than how Putnam explained it to reporters last month. Putnam has repeatedly said NICS checks are used for non-criminal disqualifying histories, like a mental health issue, a dishonorable discharge from the military or a drug addiction. Two other backgrounding systems, one state and one federal, are used to search for criminal histories, he has said. Yet those interviewed by the state repeatedly described the NICS database as a "criminal" check. Brandee Jones told investigators that the NICS background check sometimes caught people who have out-of-state felonies that are missed by other backgrounding systems. "It sounds like the NICS information is vital," the investigator said. Asked why Putnam has described the background checks differently than these employees, his office didn't immediately say. Sen. Stewart said the different descriptions of NICS are a red flag. "I don't feel confident that anything that was supposed to have been done has been done correctly and I don't think the managers and those above the managers have instructions on why it's done," she said. The interviews raise more questions about a program Putnam once said was administered "thoroughly and efficiently." "Ultimately, I'm responsible if that system breaks down," Putnam said in 2014. According to reporting this week by the Associated Press, the system had previously broken down under Putnam. In 2012, 48 employees made mistakes like not reading arrest reports or the full application when issuing permits, including ones for concealed weapons licenses, according to Inspector General reports. Employees said they were distracted and the department was poorly trained. An employee was fired, others disciplined and safeguards were put in place so these mistakes wouldn't happen again. The department created a weekly report for supervisors of any missed background checks. A new team was also supposed to randomly check permits to make sure they were approved properly. But those safeguards didn't prevent Wilde's negligence four years later, nor did they ensure that someone would catch it before 13 months passed. Putnam's office wouldn't say why the policies put in place in 2012 didn't prevent the 2016 lapse. "The new safeguards and Quality Assurance Team ensure accurate and quality licensing," said Jenn Meale, a spokeswoman, in a statement. "And the one employee who failed to perform her job correctly in the 2017 matter was terminated."